Partnership lead at the Mozilla Foundation. Both my grandfathers fought in WWII. My maternal grandfather, Jack, was a Lieutenant in the armored core, training soldiers how to pilot tanks. He then studied at Khaki College while helping oversee the return of soldiers back to Canada. Led to a career in the early days of the airline industry, retiring as the VP, Travel for Ford Canada. He volunteered helping travelers at airports till the day he died. My paternal grandfather, Al, was a safety inspector and mechanic in the Royal Canadian Air Force. He stayed in the military through the 60s, stationed in Germany and other places. Then retired to a career as a long-haul truck driver. He could recite the service numbers of everyone he worked with over 25 years. On his 80th birthday, he went down to the Ministry of Transportation, passed the mandated old-age test to renew his trucker’s license, took one step out of the door, paused, then turned around and handed it back in voluntarily. Jack’s role overseeing the trip home for 1,000s of soldiers meant that the war played itself out again on the other side of his desk. He heard the story of each soldier’s personal, lived experience as they sat getting their paperwork together. The story that stayed with me was what happened to the men who literally kicked down the doors of the concentration camps, not knowing what was on the other side. Most of them returned home to asylums. The thing I would ask them–if they were around today–is when did they know? When did they realize the rules of normal civility no longer applied? When did it become apparent they had to fight? These things don’t happen at once. They happen by inches, over years. At what point do you acknowledge it and change your response? Much has been written about fascism in the last few days. I want to believe this country is stronger than that. But I’m having a very hard time knowing how to gauge my response. I wish I could ask them for guidance. Neither of my grandfathers took pride in what they’d done. They didn’t see it as a service. They saw it as a necessity; a posture distinct from much of the rhetoric that will cross our screens today. One that I feel is more honourable–not to just to those who lived through it–but to the horrific reality of war. That’s why my wife and I pause at 11am. Why we treat this day with reverence. Why we tell our daughters about their great-grandfathers and grandmothers on both sides. Not to celebrate, but to remind ourselves we can never let it happen again. My first start-up was an MMO company. My role was to design the socioeconomic and governance structures for an online world. It was wonderfully geeky opportunity for a 20-year-old political theory major and gamer. As Raph Koster has written, the advent of many-to-many live video (Facebook Live; Periscope) and augmented reality gaming (Pokemon Go) has brought new relevance to that work, highlighting the challenges of having vital communication controlled by private interests and the resulting importance of civic tech projects. In political theory, rights — as in civil rights — have one of three points of origin that place them above government, laws, and other forms of human decision-making. Natural: ‘We hold these truths to be self-evident.’ You are human, you have rights. Divine: They are granted and flow from a god. Social: We grant them to each other. The question was whether any of these premises could hold true in a mediated environment. It boiled down to whether participant(s) could use their rights to overrule the will of the the mediator — the game maker, social media company, etc. And, in each instance, they couldn’t. Divine: The mediator is, functionally, god. What they grant they can take away. Our concept of inalienable rights assumes the basis for those rights is inaccessible and immutable. Even (most) religious people assume their god isn’t going to show up and change their mind. In a mediated environment, the mediator is an active participant, accessible to the participants, and most definitely mutable. They can change or pull the plug on the whole thing at any time, ending you, your world, and your rights. Conclusion: Our concept of rights cannot apply in mediated, or virtual, space. So, can you have rights in Facebook? Can they be obligated to broadcast your side of an interaction with the police? Facebook exists as a private entity in meatspace. They are subject to the laws and regulations of government, which means they can’t be the origin point for rights. Further, nothing prevents Zuckerberg from shutting the whole thing down tomorrow, or simply removing live streaming as a feature. So, no, you can’t have rights in Facebook. The best case scenario is where they choose to use their power to defend your rights. But they don’t have to. And this is a huge problem when Facebook (and other mediated technologies) are our central means of exposing and communicating injustice and the abuse of state power. The test has yet to resolve, but it’s exciting none-the-less. We’ve been ramping up our AB testing capacity. We’ve had robust testing frameworks in place around our e-mail program for a while. But we hadn’t brought that rigour across to our campaign page design. 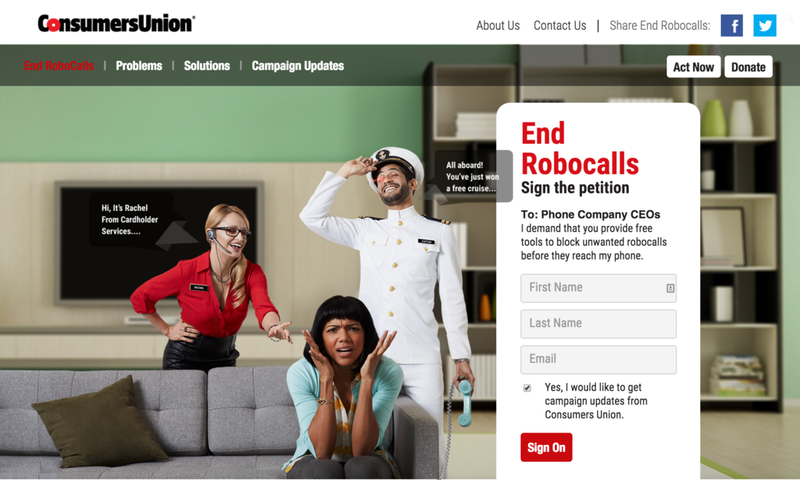 We set up the first web AB test on our End Robocalls site. We chose to optimize for signing the action: completing the white form on the top right. Our guess was the original page design presented too many options to the user. So we built two variants, each of which removed menu options from the top of the site. 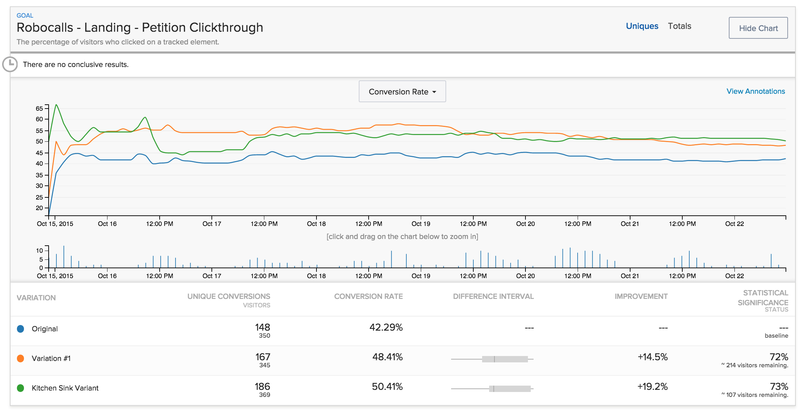 As expected: reducing navigation options is resulting in higher conversion. This was a safe thing to test. It’s fairly common knowledge that fewer exit points within a simplified user interface leads to higher conversion. The key thing, however, is that we now have the data to show the best practice also holds true for our community base. And it’s a great way to launch our testing program. This is a finding we can take forward into the rest of our work. One that will have real impact. Building from this result will let us engage thousands more people in the actions we take to advance consumer rights. As a Canadian, I grew up in a place that is almost but not quite the USA. We consume the same culture, eat the same food, work in the same industries. American and Canadian values are closely aligned. But they differ in two big ways. Through a Canadian lens, Americans are distinguished by their innate ambition and sense of individual responsibility. At their best, they represent America at its best. But their echoes can be held responsible for this country’s dark side. Ambition underpins America’s innovative industries, its dominance in sport, the (eroding) strength of its middle class, its cultural force around the world, and its remarkable universities. Walk into any coffee shop and you’ll find two American 20-year-olds working on a start-up to take down Citibank. In the USA, they’re cheered on. In Canada, they’d be politely patted on the head. The belief that anything can be accomplished is uniquely American. It’s what has drawn me and countless other immigrants to this place: the promise of unbounded, global opportunity. Similarly, a profound sense of individual responsibility is what makes America one of the most philanthropic countries in the world. Americans are dedicated and loyal to their families. They volunteer their time and join community organizations. They hold a deep reverence for public service. Americans do things because if they don’t, no one else will. They step up. But ambition is also responsible for the idiocy of Donald Trump and the dumbing of political debate, capitalism’s devastating interventions in the Middle East, nuclear weapons and the military industrial complex, the damaging and divisive myth of American Exceptionalism, the unprecedented consumption of natural resources and the resulting environmental damage, the 21st century crusade against Islam, and Kim Kardashian and the worship of fame. You’re with us or against us. USA! USA! USA! Similarly, individual responsibility is why America has no social safety net, imprisons more of its citizens than any other major country, is the only western democracy to still have the death penalty, fails to recognize systemic injustice, champions the second amendment, has 6 of the top 15 cities with the most homeless residents, sees poverty as a sin, and believes that a black President marks the end of racism. They had it coming. Sink or swim. Should’ve known better. Still, I find myself drawn here. I love Canada but ran into its limits. I hope my daughters grow up with the best of this country and deep, personal ambition to fix the rest.